I made this easy homemade wood polish for a wood and crochet teether for baby niece’s Christmas present, but I like it so much I plan on using it all around the house. 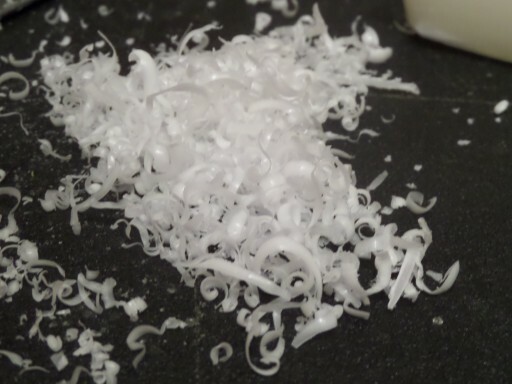 It is all natural, safe for baby to chew on, and best of all, super easy to make. 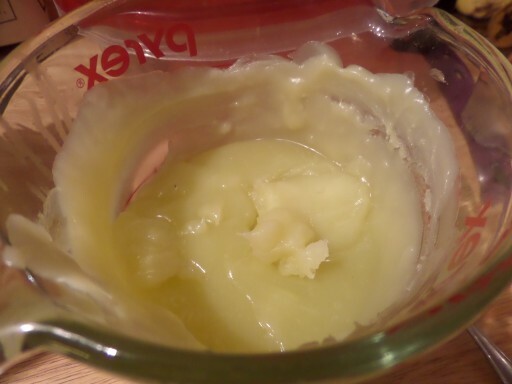 It only takes 2 ingredients, beeswax and olive oil. The hardest part is grating the beeswax. 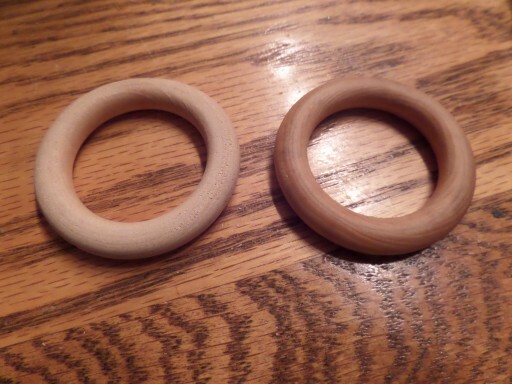 It gives wood a nice, natural finish while protecting it from water stains or scratches. 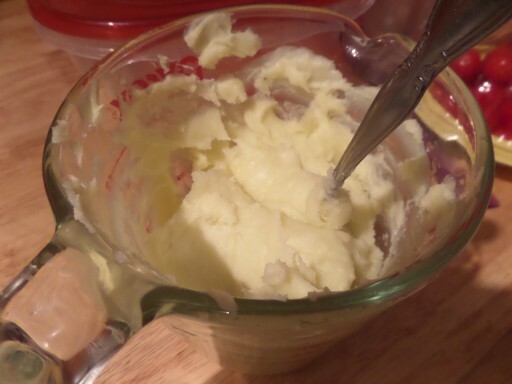 I followed a recipe I found at Hello Bee. 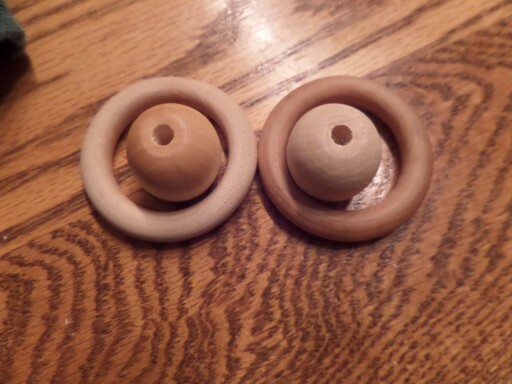 She used it to protect wooden Easter egg toys, which are so cute, I may need to think about them this spring. 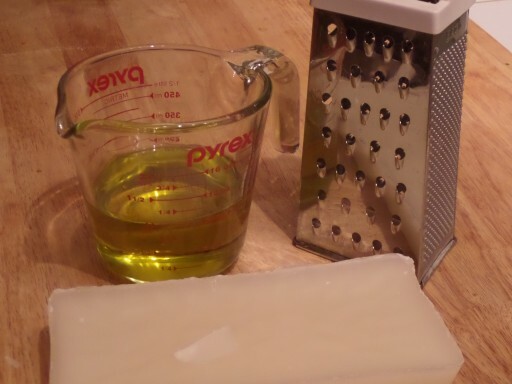 All you need is beeswax, olive oil, a glass measuring cup and a cheese grater. Oh, and a spoon. I didn’t have a source for local beeswax so I bought mine at Michaels. I found it in the candle making section. 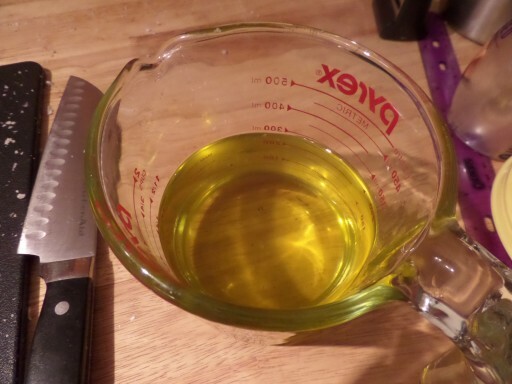 You can use just about any oil, but as I had a super sized jug of olive oil on hand, that was my oil of choice. 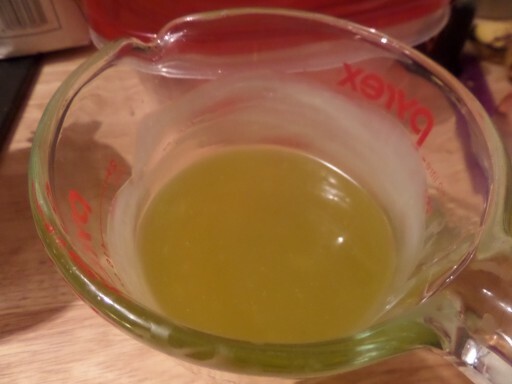 Start by measuring 1 cup of oil in the measuring cup. 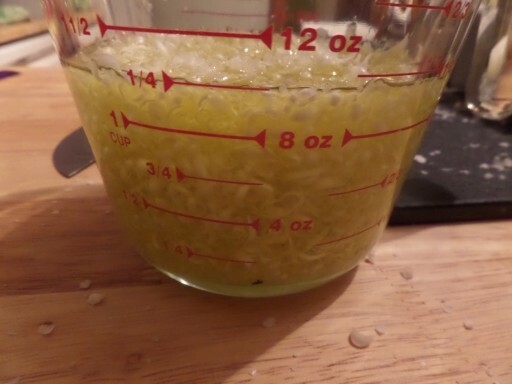 Then add shredded beeswax until the total volume is 1 1/4 cup. We are going for a 4 to 1 ratio of oil to wax. The hardest part of this really was grating the beeswax. It is a lot harder stuff than I realized. It probably took me half an hour to get 1/4 cup grated, but then again, I do have wussy little girl arms and I was using a cheap box grater. If I do this again I’ll need to find a better method. Luckily the recipe makes quite a pit of polish and keeps for up to a year. 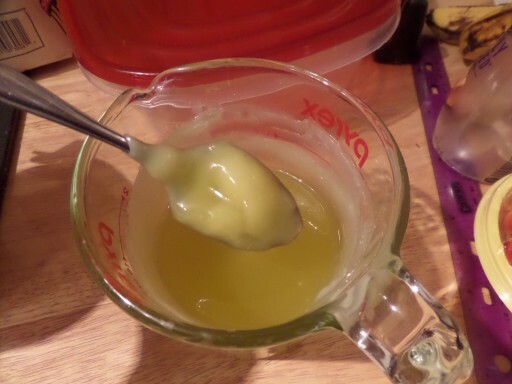 Once you’ve added enough wax to bring the liquid up to 1 1/4 cups, microwave the mixture until the wax melts. It took about 2 minutes in my tiny microwave. Watch it closely though, apparently beeswax can catch fire. I don’t want to be responsible for you burning down your kitchen. The wax will melt completely and the mixture will be clear. Now the fun part, waiting for it cool. As it cools, stir it every few minutes. At first it will be like stirring olive oil, but as it gets cooler it will start to thicken and collect along the sides of the glass. Just keep stirring it ever few minutes to make sure it cools evenly. It will eventually get quite thick and whitish. And that’s it. Once it was completely cool, I moved into a mason jar to store. According to the internet you can store it in an air tight container at room temp for up to a year. To polish wood, just use a small amount on a clean cloth and rub it into the wood until the wood isn’t greasy. Here are some before and after pics. Apparently you can even use the wood polish as skin cream or lip balm. I should mention that my beeswax from Michael’s specifically says it is not cosmetic grade, so keep that in mind before you eat the whole jar or anything, but I did put a little on my chapped lips and it was amazing. After polishing the wood my hands were really soft too, so I completely believe it would be excellent skin cream, if you don’t mind smelling a bit like olive oil. 2 Responses to "DIY Beeswax Wood Polish"
I don’t remember exactly, what ever I had in the cupboard at the time, probably Kirkland from Costco or the store brand from Cub Foods. I don’t spring for the fancy stuff, especially for crafting.